This love of community and music has been an integral part of Susan’s life. She’s devoted countless hours of her talent and fundraising abilities to benefit Mir-amichiers and those far beyond our region. 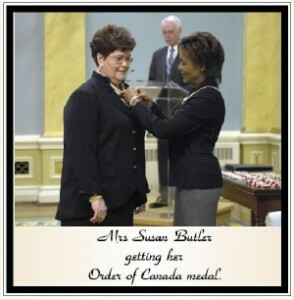 On February 9, 2007, Susan Butler received the Order of Canada in a ceremony in Ottawa. 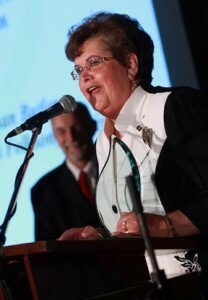 With this award, the highest Canada offers her citizens, Susan was recognized for her 25 years of service as director of the Miramichi Folksong Festival, her fundraising initiatives which have raised hundreds of thousands of dollars both locally and internationally, including the Canadian Red Cross, local high schools, and the Alzheimer’s Society. In two eight-hour non-stop music concerts, Susan raised money for victims of war in Kosovo, and $20,000 for hurricane relief in the aftermath of Katrina in the southern United States. 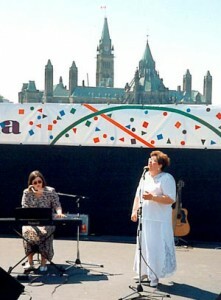 When she answered the Governor General, Susan was pleased to confirm that she could indeed sing unaccompanied and performed her own composition, “Proud to be Canadian,” to a very enthusiastic audience at the gala dinner after the ceremony. Musically, Susan’s life has been very exciting. 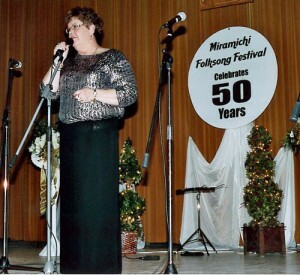 She organized and performed a tribute to the Westray miners in 1986, wrote and performed the theme song for the Special Olympics in 1993, hosted a BT Voices for Hospices in 2000 where choirs performed internationally and the funds were donated to palliative care units in hospitals. She’s seen many changes. “The hardest part of any change was watching the old folks die off. The worst experience I ever had was the night that Perley Hare sang and went over to the Black Horse and ordered a beer and by the time the waiter gave him the beer he was dead at the table. 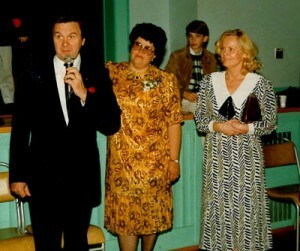 He sang the ‘Banks of the Clyde’ that night and he sang it like he had never sang it before. “Over the years, I have gotten to know many wonderful people, the majority of which were a delight to work with. 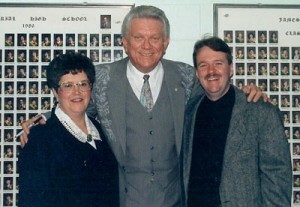 Frank Patterson came many times, as did Rita MacNeil, her first performance in New Brunswick. Unknown at her first visit, not a space was wasted for her second. She came with Men of the Deeps. We have a lot of the old music but more of the new. And when I took it over I began to mix the professionals and the amateurs. I say a professional is someone who gets paid more.” If that is the case, Susan is still an amateur. The only compensation she receives for her time and energy is satisfaction. 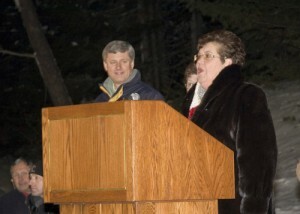 During the years Susan was directing the festival, she was employed fulltime as Director of Activities and Volunteer Services and as Chaplain at Mount Saint Joseph Nursing home. Her music was vital to her work. “People don’t realize how powerful a tool music is for people who are sick. It mellows them, soothes them and if they are agitated can change their behaviour instantly. It is a universal language and the most communicative tool we have in society today. 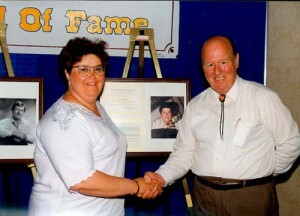 What Susan describes as the biggest turmoil in her life occurred in January of 2003. “My family was with me when the doctor came to the house to tell me I had cancer. For two days I stayed in denial and fought my inner feelings, then when it sinks in . 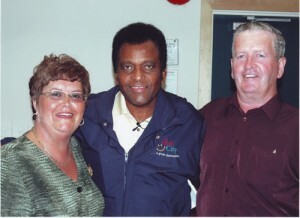 . .
Susan Butler with Charlie Pride, one of the many famous performers she has brought to Miramichi. “I remember one night being so hard. I was to have my surgery, the first week of February and I had a big dinner concert coming up the following week. Everything was organized. I even had the desserts made. I didn’t know what I was going to do. Then, it was just as if someone put a hand on my back and asked, ‘Are you going to let this get the better of you?’ And I thought, no. I’ve got too much living to do. I’ve got too many things to accomplish to put up with this kind of foolishness. “I didn’t look back. I had 38 great years there and was satisfied with what I had accomplished. Now, I don’t know how I managed to do all that I did. My husband is always saying I don’t know how to relax but I have ways. Choir practice is my relaxation . . . I have one confession: I watch 2 soaps. Everyday I ask myself why I watch them but then I show up to see what Samantha and the other characters are up to. I listen to CBC continuously. I think it connects all Canadians to the world. In the meantime Susan will do what she has always done, give of herself to this community and she will sing. 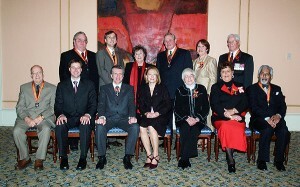 As Susan prepared for the 55th Festival, she was honoured with a Dr.of Letters Degree from St. Thomas Univsersity on July 11, 2012 ,at their Summer Convocation in Fredericton. In her address to the convocation, Susan asked the graduates to give back to society, become a volunteer and be as enriched as she is.